Citation Information: J Clin Invest. 2012;122(8):2780-2792. https://doi.org/10.1172/JCI62888. Inflammatory bowel disease (IBD) is a chronic illness caused by complex interactions between genetic and environmental factors that propagate inflammation and damage to the gastrointestinal epithelium. This state of chronic inflammation increases the risk for development of colitis-associated cancer in IBD patients. Thus, the development of targeted therapeutics that can disrupt the cycle of inflammation and epithelial injury is highly attractive. However, such biological therapies, including those targeting epidermal growth factor receptor pathways, pose a risk of increasing cancer rates. Using two mouse models of colitis-associated cancer, we found that epidermal growth factor receptor inactivation accelerated the incidence and progression of colorectal tumors. By modulating inflammation and epithelial regeneration, epidermal growth factor receptor optimized the response to chronic inflammation and limited subsequent tumorigenesis. These findings provide important insights into the pathogenesis of colitis-associated cancer and suggest that epidermal growth factor–based therapies for IBD may reduce long-term cancer risk. 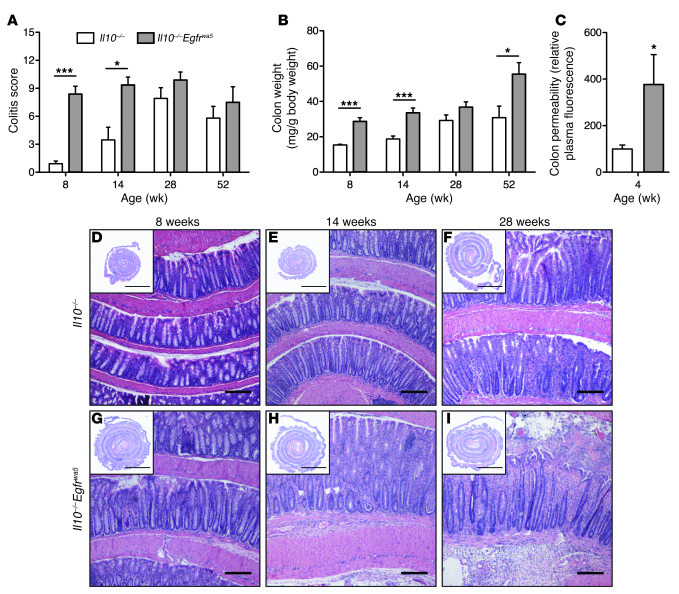 EGFR mitigates colitis in Il10–/– mice. Colitis scores (A) and colon weights (B) of Il10–/– and Il10–/–Egfrwa5 mice at the indicated ages; n = 6–15; *P < 0.05, ***P < 0.001. (C) In vivo colon permeability assay of Il10–/– and Il10–/–Egfrwa5 littermates at 4 weeks of age as determined by FITC-dextran enema; n = 3, *P < 0.05. (D–I) Representative H&E colon sections from mice of the indicated genotypes and ages. Scale bars: 5 mm, overview insets; 100 μm, high-power fields.